Donald Trump announced Friday that he’s tapped Indiana Gov. 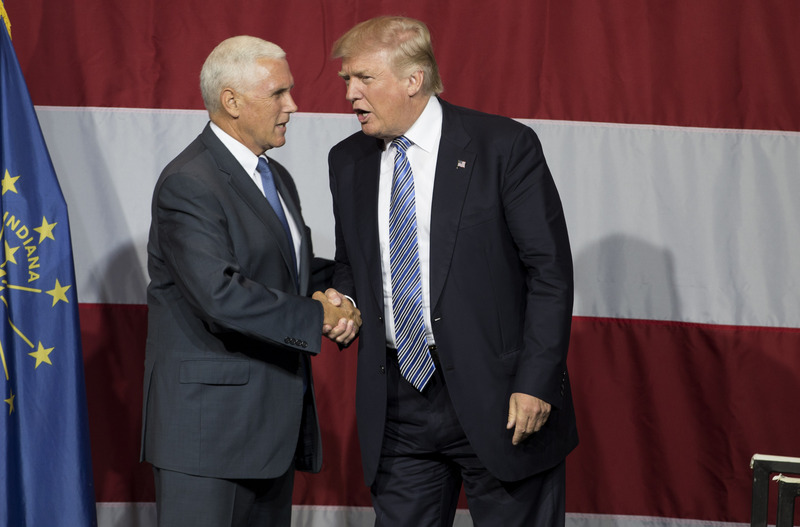 Mike Pence to be his running mate — but a match made in heaven this is not. Trump and Pence have a number of significant policy disagreements, and it’s not clear that the two click particularly well on a personal level, either. Yet there’s a long history of vice presidents not getting along with their presidents, so if Trump and Pence get elected, they’ll be continuing a longstanding tradition. Pence, who supported Ted Cruz in the primary, supports free trade, was a co-sponsor of the Iraq war resolution in 2002, and once called Trump’s proposed ban on Muslim immigration “offensive and unconstitutional.” Trump, meanwhile, asked his aides late Thursday evening to ask if he could back out of picking Pence, according to multiple reports. “It's disorienting to have had commiserated w/someone re: Trump - about how he was unacceptable, & then to see that someone become Trump's VP,” wrote Dan Senor, a former policy adviser to Mitt Romney, on Twitter. As two centrist Democrats from Southern states, Gore and Clinton initially clicked well, but their relationship soured over the course of Clinton’s presidency. Gore reportedly took issue with Clinton’s handling of the Monica Lewinsky scandal, as well as the power delegated to then-First Lady Hillary Clinton. When Gore ran for president in 2000, he refused to campaign with Clinton. LBJ had a legendary feud with Robert F. Kennedy, and his relationship with his brother wasn’t much better. JFK constantly sidelined Johnson when the two were in the White House, shelving Johnson’s requests for more autonomy, limiting their one-on-one meetings, and making it clear that the vice president was not part of the president’s inner circle. Johnson later said that he felt like a “raven hovering over [Kennedy’s] shoulder” during his vice presidency. Eisenhower and Nixon had a complicated relationship. Though Nixon had great respect for the president under whom he served, Nixon frequently felt belittled by the president. When Eisenhower was asked in 1960 to name a major contribution Nixon had made to his administration, he said, “If you give me a week, I might think of one.” Oddly enough, Nixon’s daughter ultimately married Eisenhower’s grandson. When Nixon became president, he followed Eisenhower’s lead and gave very little power or autonomy to his own vice president, Spiro Agnew. Agnew said that he was “never allowed to come close enough to participate with [Nixon] directly in any decision,” and that he would have rather been Lyndon Johnson’s vice president. Nixon attempted to replace Agnew in 1971, and backtracked only after his preferred replacement, Treasury Secretary John Connally, refused to take the post. In the early days of the Republic, the vice presidency was assumed by the candidate who came in second place in the presidential race. Jefferson and Adams entered the White House already disagreeing on quite a bit, and their relationship deteriorated throughout Adams’ presidency. Jefferson found Adams too reflexively partisan, and Adams refused to consult Jefferson on major national policy issues. Four years after they were elected, Jefferson ran against Adams for the presidency and won.